I happened upon this book when I was looking for information about artist Alex Ross and his amazing illustrations of the 1970s animated television show, Battle of the Planets. I ultimately bought it as a companion piece to the Alex Ross: Battle Of The Planets Artbook and I'm glad I did. Ross's book is a beautiful collection of his work, but it doesn't contain much information about the show itself. G-Force Animated, however, has it all. The book not only provides a complete history of the show, but also early production sketches, interviews, scripts, paintings, and designs from Battle of the Planets (BOTP) and the show it was adapted from, Science Ninja Team: Gatchaman. For those of you too young to remember, BOTP premiered on American television in 1978, at the height of Star Wars mania. Although the originally show was quite earth-bound, it was retooled for the U.S. to have more outer space themes as was reflected by the title. There's an interesting history behind how this happened which highlights the major differences between American and Japanese animation houses in the late 1960s and early 1970s. In the states, this was the Hanna-Barbera era. Cartoons like Tom & Jerry, The Jetsons, Yogi Bear, Scooby Doo and The Flintstones were ubiquitous and one-dimensional. For Americans, animation was synonymous with children. And the low-grade comedy made the aforementioned shows little more than livelier versions of the Sunday comic page with as much social relevance. But Gatchaman was different. Although it had some American influences, it was a thoroughly Japanese creation with elements that would've never passed muster in the United States. One of the most profound had to do with the Science Ninja Team's first arch enemy, called Berg Katse (Zoltar in BOTP). Berg Katse may have been animation's of first transgendered personality. This is not a trait he could control and there were times when he'd rapidly shift between genders. 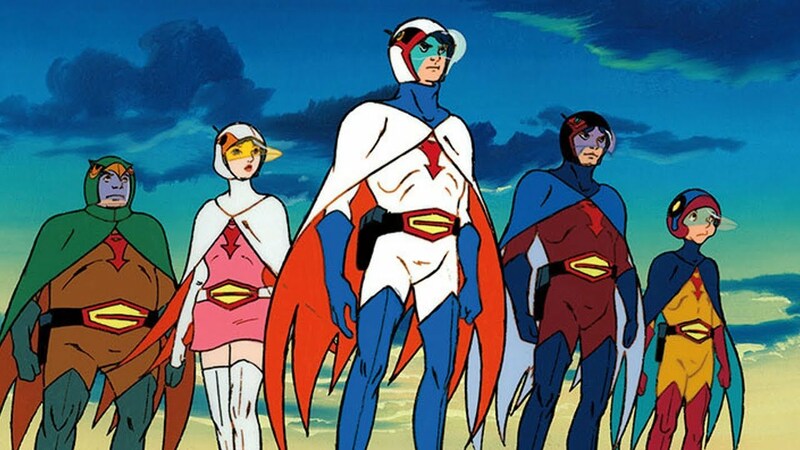 As it turned out, however, this adaptation often allowed the villain to elude the Gatchaman team. When legendary television producer Sandy Frank brought Gatchaman to the United States, he had to westernize the production. Needless to say, Zoltar's transgender identity disappeared entirely, and despite his decidedly feminine features, he was depicted as a male figure in BOTP. But perhaps the most obvious change in the show was the addition of 7-Zark-7. This decidedly R2-D2-looking robot lived in an undersea command center and acted as the G-Force's 911 call center. 7-Zark-7 also provided backstory and exposition bridges since the BOTP episodes were so sliced and diced that it left the original story line in tatters. The origin story for the Gatchaman team is also peculiar... and perhaps a little disturbing. Although the American version notes that the team is comprised mostly of orphans, what's not as obvious is that Chief Anderson, who acts as the team coordinator, is also the adoptive parent. In the Japanese version, he collects the orphans, provides them with super powers through some kind of mysterious implants, and then raises them into the Science Ninja Team. I suppose one could argue that this smacks a little of slavery and brainwashing. Good luck finding those themes in Yogi Bear. G-Force Animated is probably something only a diehard fan would want to read. It's not a particularly well written book and there are parts that are poorly organized. Still, the content is valuable if you happen to love any of the BOTP incarnations. Plus, there are plenty of illustrations and photographs which are fascinating to browse.